This hinge is for residential applications only. All steel base material. Non-removable steel pins are available for $1.00 -- call for details. Heavy 0.087 Gauge(2.2mm) thickness. Five knuckle design. Also available with 5/8" round corner. 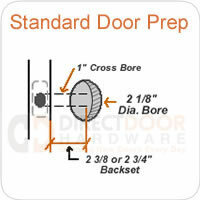 For doors equipped with automatic closer or high traffic, use ball bearing hinge. Gauge of Metal - .087"
Wood Screw Size - #9 x 1" OR #9 x 3/4"
The hinges I replaced were the typical friction type, that slowly wear out from years of bearing the weight of a heavy door. The new bearing hinges are so smooth and effortless to open. They were a little harder to replace since the old hinges had deteriorated so quickly in the last few days before I had ordered them. The door was sagging and misaligned so I had to put a wooden wedge between the floor and the door to remove the strain. Great hinges! 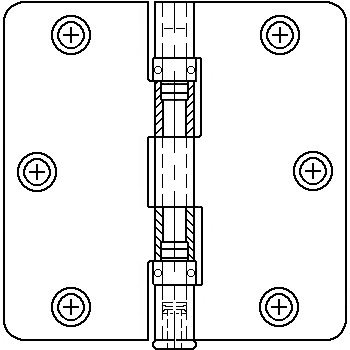 Use this to support a very heavy closet door with a mirror. Operates smoothly and I expect to get many trouble free years of use.